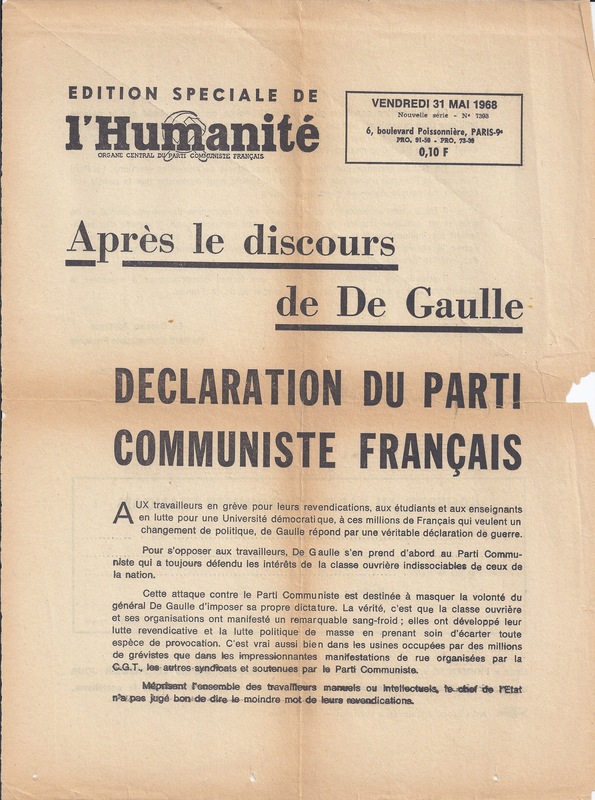 With Workers on strike for their demands, with students and teachers in a struggle for a democratic University, with millions of the French people wanting a change of policy, de Gaulle responded with a veritable declaration of war. 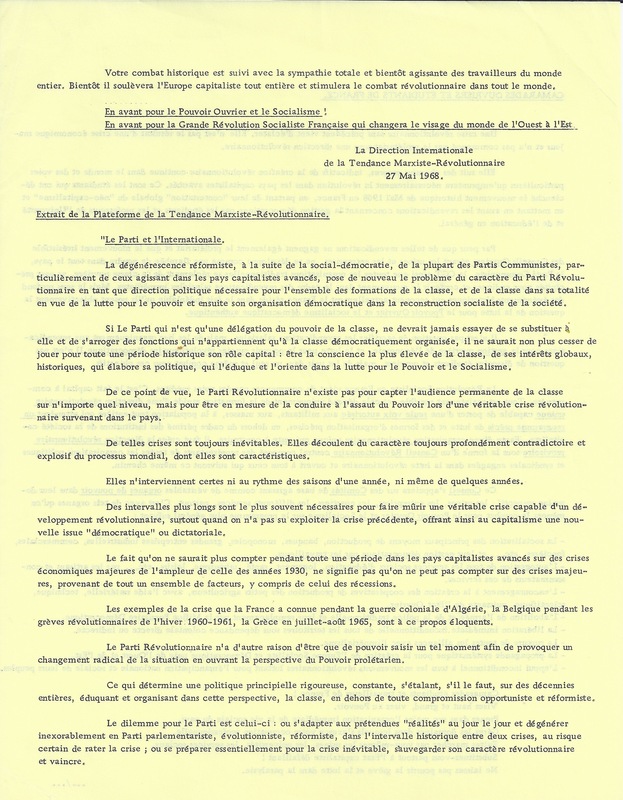 in his opposion to the workers, De Gaulle first takes on the Communist Party which has always defended the interests of the working class, inseparable from those of the nation. This attack against the Communist Party is designed to mask the wish of General de Gaulle to impose its own dictatorship. In reality, the working class and its organizations have shown remarkable composure; they have developed the fight for their claims and theit mass political struggle taking care to avoid any kind of provocation. This is true in both the factories, occupied by millions of strikers, and in the impressive street demonstrations organized by the C.G.T. and other unions, supported by the Communist Party. Scorning all workers, both blue- and white-collar, the head of State did not judge it worth saying a word about their claims. However, the first condition for settling the huge conflict caused by the harmful policies of a State at the service of corporations, is to uphold the legitimate demands of the workers. This is the unanimous demand of the unions. 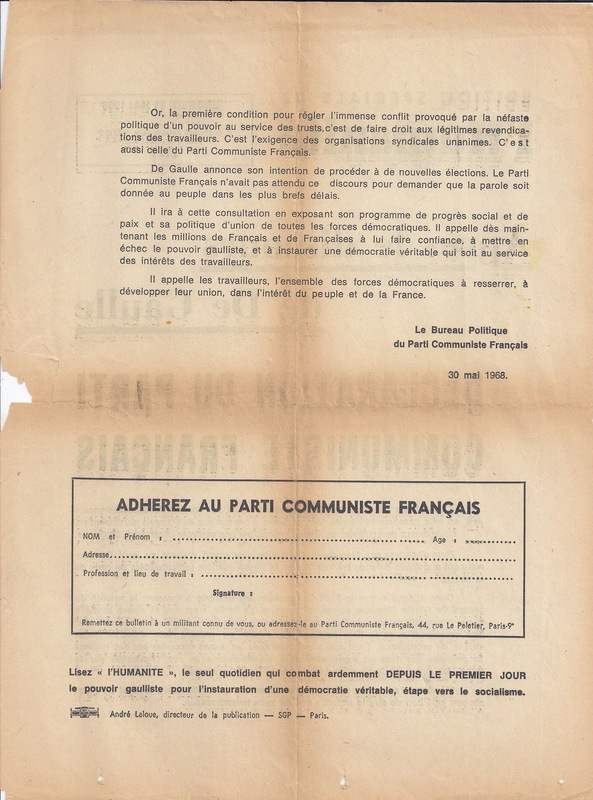 It is also that of the French Communist Party. 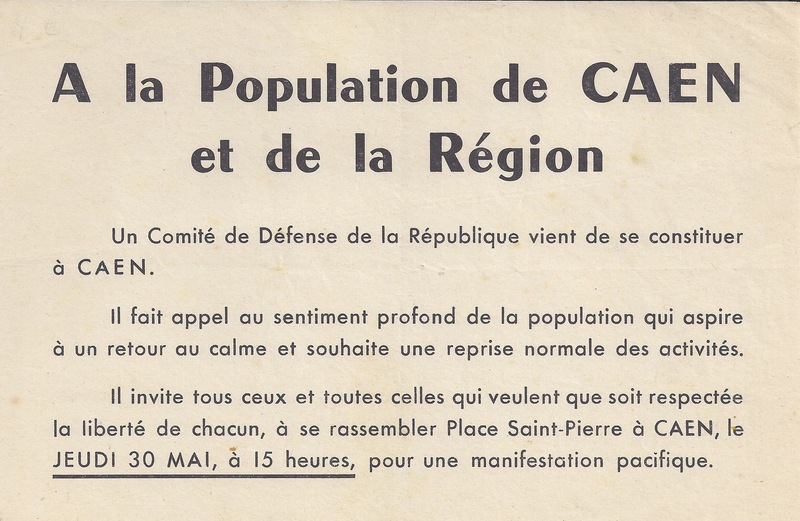 De Gaulle announced his intention to call new elections. The French Communist Party has not been waiting for this speech to demand that the people be given their say as soon as possible. The Party will go to this compaign explaining its program of social progress and peace and it’s policy of the democratic unity of all forces. 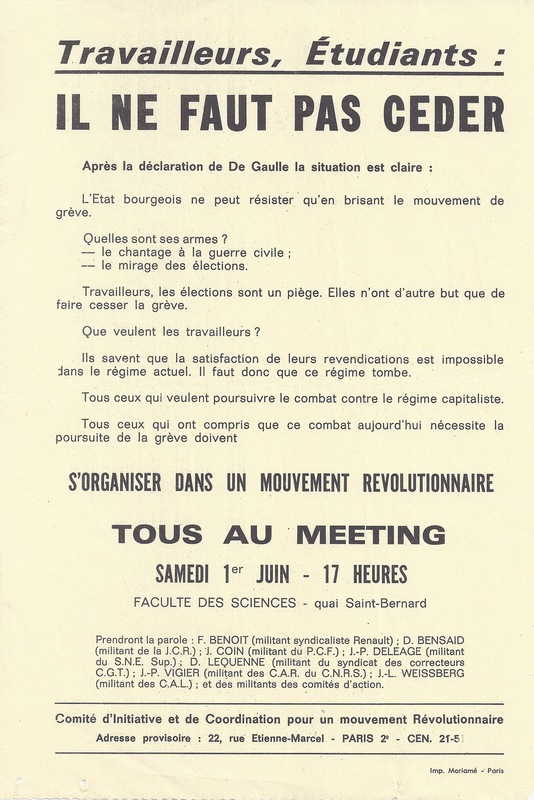 It now calls upon the millions of Frenchmen and Frenchwomen for their trust, to defeat the Gaullist government; and to establish a true democracy that serves the interests of workers. 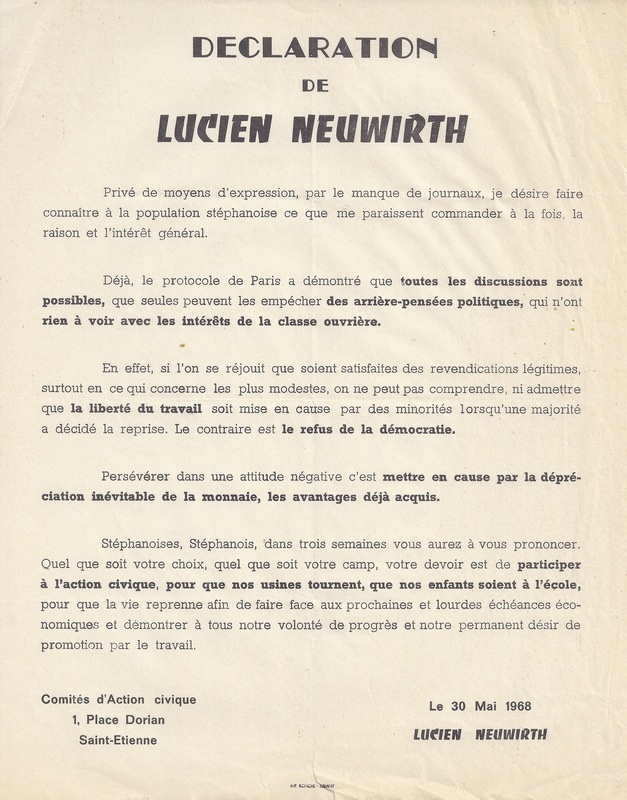 It calls on workers, to join strongly with the democratic forces, to develop their unity in the interests of the people and France. An unprecedented revolutionary crisis has just broken out. It is not the result of a major economic crisis and was not started by the proletariat under a revolutionary leadership. It is following its own path, which points to the continuation of revolutionary creation in the world and the particular courses that revolution will follow in advanced capitalist countries. 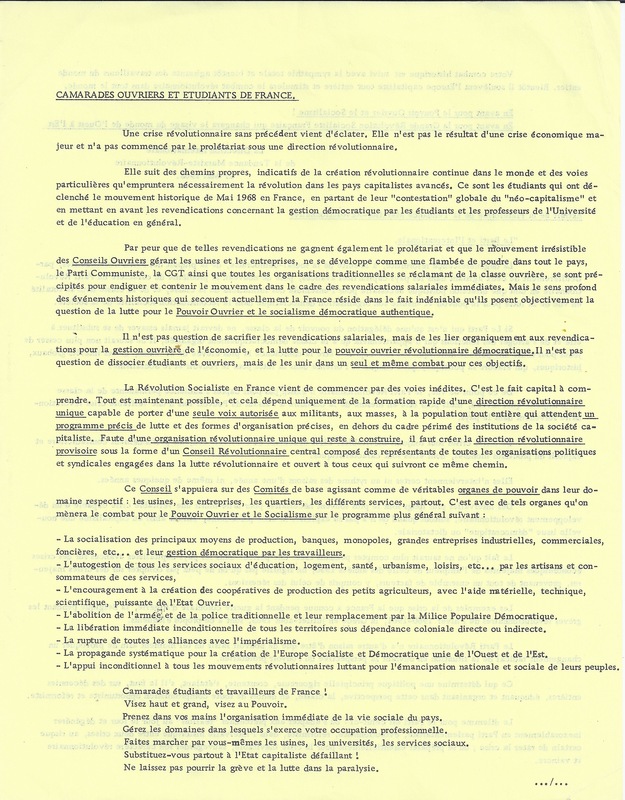 It was students who launched the historic movement of May 1968 in France by starting out from the total rejection of “neo-capitalism” and by putting forward demands concerning the democratic control of the universities and education in general by students and teachers. Fearing that similar demands might reach the proletariat as well and that the irresistible movement of Workers Councils running the factories and businesses might spread like wildfire through the country, the Communist Party, the CGT and all the other traditional organizations who associate themselves with the working class rushed in to stem the tide of the movement and contain it within the framework of immediate wage demands. But the real meaning of the historical events that are presently shaking France is to be found in the undeniable fact that they objectively pose the question of the struggle for Workers Control and genuinely democratic socialism. There can be no question of sacrificing the pay claims, but they must be organically linked to the demand for workers control of the economy and the struggle for revolutionary and democratic workers power. There can be no question of separating the students and workers. They must be united in the same struggle for these objectives. The Socialist Revolution in France has just begun, in an unprecedented way. This is the essential fact to understand. Everything is now possible and depends entirely on the quick formation of a united revolutionary leadership capable of speaking with the authority of one voice to militants, to the masses and to the whole population, which is waiting for a precise plan of struggle and precise forms of organization, which will go beyond the obsolete framework of the institutions of capitalist society. Because there is not yet a united revolutionary organization, the provisional revolutionary leadership must be created in the form of a central Revolutionary Council, made up of representatives of all the political and trade-union organizations committed to the revolutionary struggle and open to all those who will follow this path. – The socialization of the principal means of production, the banks, the monopolies, the big industrial, commercial and property-owning concerns, etc… and their democratic control by the workers. – The democratic control of all education. housing, health, town planning and leisure services, etc., by the producers and consumers of these services. -Encouragement for the creation of production co-operatives for small farmers with the powerful material, technical and scientihc aid of the workers state. – The abolition of the traditional army and the police and their replacement by a democratic peoples militia. – Immediate and unconditional independence for all territories under direct or indirect colonial rule. – The breaking-off of all alliances with imperialism. – Systematic propaganda for the creation of a Socialist and Democratic Europe united from East to West. – Unconditional support for all revolutionary movements struggling for the national and social emancipation of their peoples. Comrade students and workers of France! Aim high and far, aim at power. Take the immediate social organization of the country into your hands. Take control of everything involved with your working life. Run the factories, the universities, the social services yourselves. Substitute yourselves for the decaying capitalist state! Don’t let the strike and the struggle founder in paralysis. Your historic struggle is being followed, and soon there will be active sympathy from workers all over the world. Soon it will stir the whole of capitalist Europe and stimulate revolutionary struggle all over the world. Forward for Workers Power and Socialism. Forward for the Great Socialist French Revolution that will change the face of the world from the West to the East.